Kids watching the sun set as someone shags the ball from the lake. After four weeks on the beach, getting off the bus in Phnom Phen was a nightmare. Tuk tuk driver screaming into the bus before I could even get off it. Swarming and yelling, all within the midst of the teeming city, it’s enough to make you stay on the bus and go wherever it goes. Not every city is opulent or has a long scroll’s worth of things to see. Some cities are just busy places of industry, places where people are trying to get by and get things done. Phnom Phen is one of those. My reaction reminded me of getting to Kathmandu after a week in isolated, deserted Tibet. I was shocked by the people and the noise and wanted to leave immediately. I spent a single day in the city. I had some good falafel, played hacky sack with some local kids at the mosque and watched the sun go down. There is a lot of hacky sack in Cambodia and I join whenever I can. it’s a good way to meet the locals. I decided to head to Siem Reap the next morning. 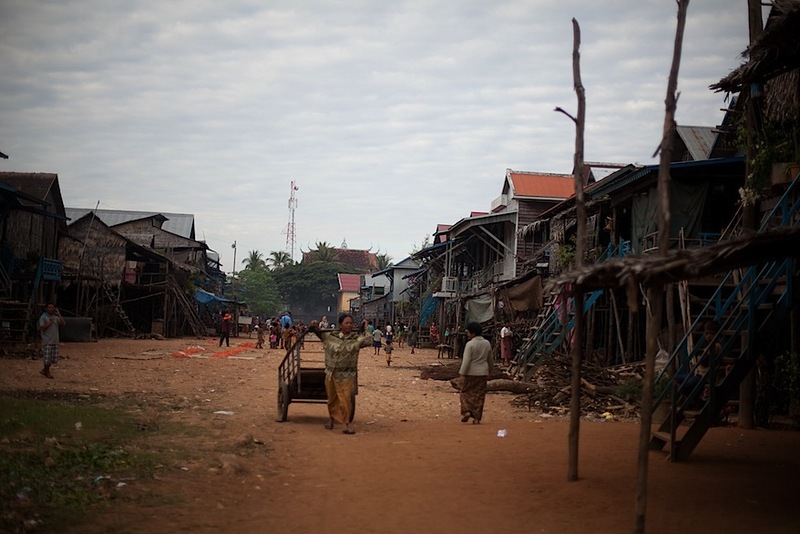 I didn’t know what to see the next day and I would rather spend the time in smaller Siem Reap. 7 hours on the bus with the horrible Cambodian music videos blaring got me there. 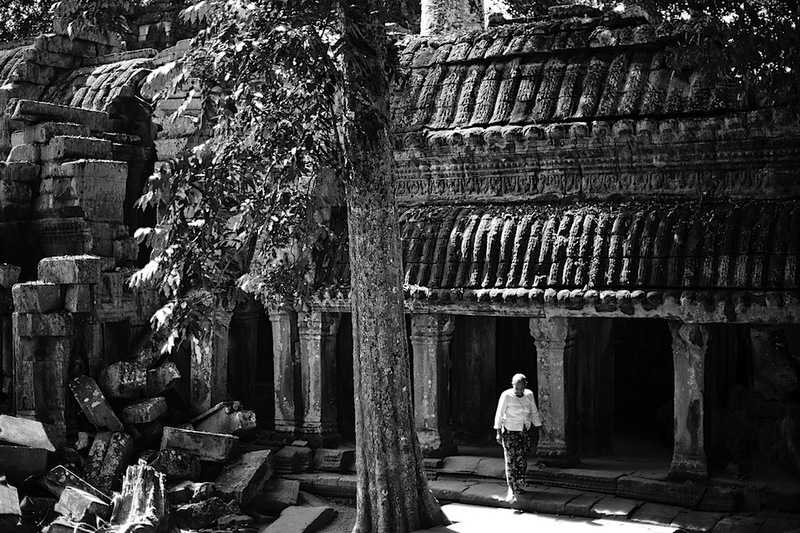 I first learned of Angkor Wat some twenty years ago. A friend had found out about it in some book and we sat at the table marveling at the these black and white photocopies. The scale of the thing was stunning. We didn’t really know where it was or really anything about it. But it stuck in the craw all these years and I was pleased to get to see it. There are moments when traveling that are good travel moments: those times when you know are you somewhere amazing, or where things really happened…those moments when you feel really far from home. New York, Hiroshima, Mt. Everest. 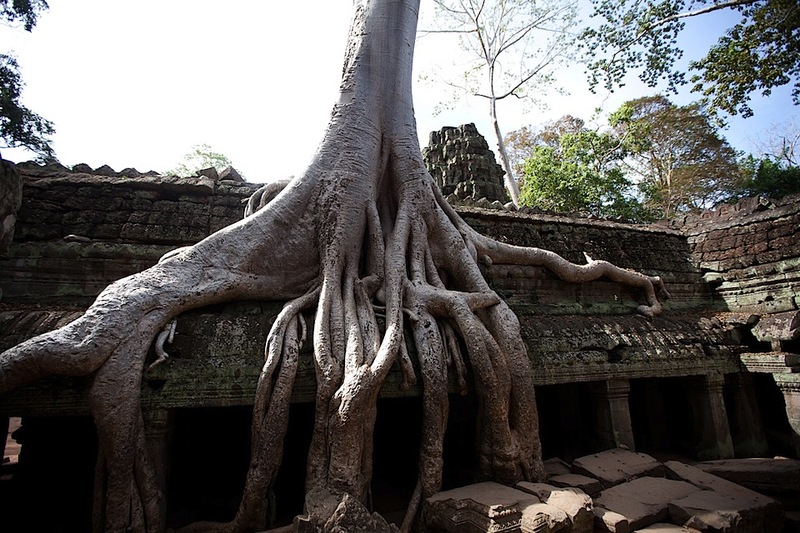 For me, Angkor Wat was one of these places. After all these years, I was in the home of one of the largest temples in the world; a huge place that supported a huge population more than 1000 years ago, and then collapsed completely. The complex is a series of temples spread over and area the size of Manhattan. It’s been cut back out from the overgrown forest and the scale is stunning. The buildings that remain are enormous and the environs are strewn with countless cut stones from buildings that collapsed or were vandalized. 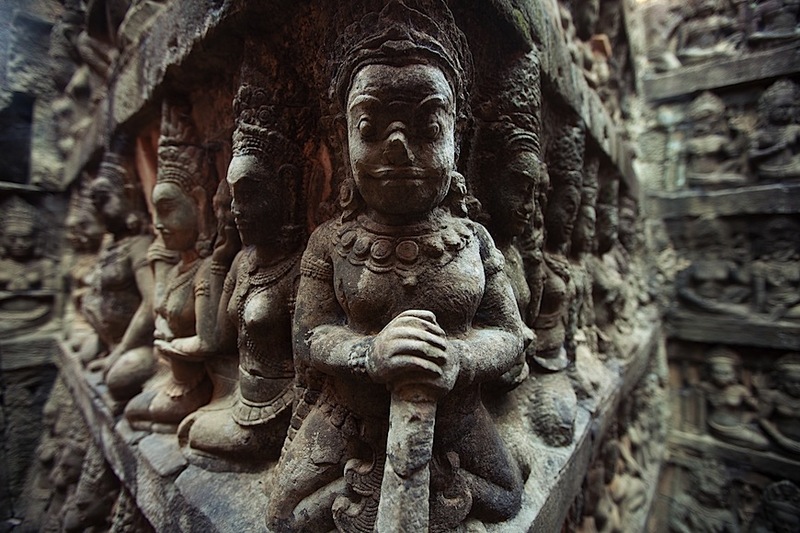 Most of the surfaces were ornately carved with images or gods or kings or battles or whatever. Huge statues and monumental bas reliefs, the size is staggering. This is the place where the trees are growing out and around the walls. It’s the main tourist attraction in Cambodia and we are out in droves. Buses and tuks and motorbikes abound as we zip from place to place, trying to drown out the shrill chorus of hawker women peddling water, scarves, and other tourist crap. I figured out in India that the forcefulness of the selling is proportional to the poverty. That means that these people are quite poor. Plus there is the smoldering anger that accompanies anyone that is turned down a million times a day, while we tourist get our endless photos and slyly compare rigs. But for all that, for all the effort, distance traveled, anticipation wasted, I was underwhelmed. Perhaps I am turning into the jaded traveler. I am certainly not at the eye-rolling “you don’t know the real…” stage. It’s a very impressive pile of rocks. But in the end, a pile of rocks. Perhaps it’s because they are hard to photograph. They are wider than tall and that makes it very difficult to provide a proper scale to the thing. Each photograph is a small snapshot of a much larger, more impressive thing and perhaps I am frustrated by the inability to get it properly. 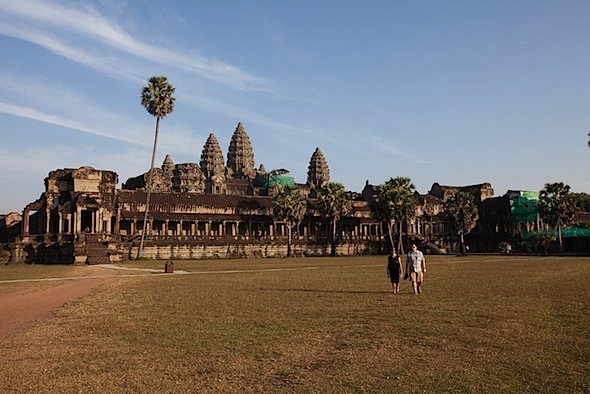 I certainly know I am getting sick of the CONSTANT touting that comes with Siem Reap. It’s impossible to walk 20 feet, honestly, without being heckled for food, rides, girls, massage, fish massage, marijuana, bus ticket, whatever. It’s exhausting, but few things are uglier than snapping at a local for interrupting your precious vacation. So while others take 5-7 days to see everything, I am done with them after 3. I can’t muster the energy to do the sunrise photos because in the end, it’s more photos of things I already shot. But there are still the nice moments. Smiles from the lovely children, shouting ‘hello’ and delighted at the reply. Girls getting photos with me because I am the big, handsome foreigner. Having the old guy take me to all the good shots behind the scenes. Finding a perfect mango laasi. 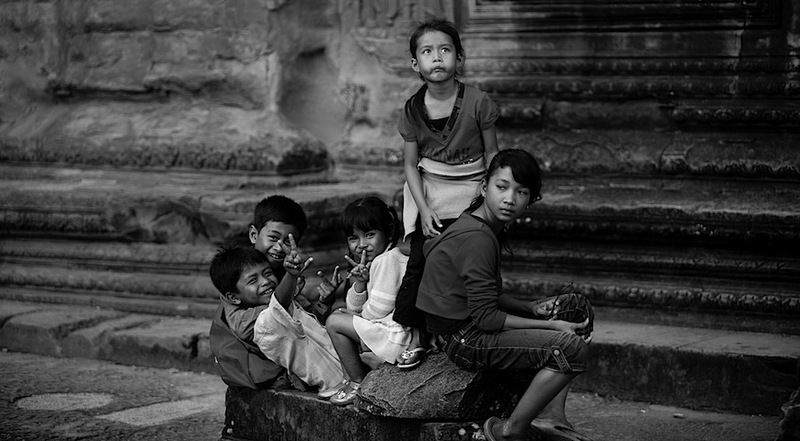 Kids at Angkor. Love the one standing. 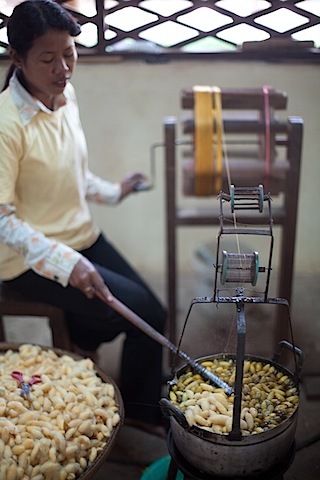 I found this organization called Artisans D’ Angkor. This place trains locals to be artists. Sponsored by the French, it’s a well run school that produces excellent work. They have a school you can visit, where you can see them learning wood carving, marble sculpting, silver and lacquer work, silk making and silk painting. And it turns out it was 50 ft from my hotel! I walked by the sign many times and didn’t notice it. I signed up for a free trip to the silk farm, where they grow the mulberry, raise the worms, and do the entire silk making process from worms to scarves. But for me, the highlight of the week was my visit to the floating village. There is a very large lake next to Siem Reap. It’s one of the largest natural features of the country. It’s unique in the world in that every year, in its reach to the sea, the floods cause it to reverse course and the river heads back and fills the lake. it grows 5 times from low, dry season to full, wet season. It’s also the largest freshwater fishery in Asia. It’s a vital resource for many people. Those that live on the lake live a unique life. 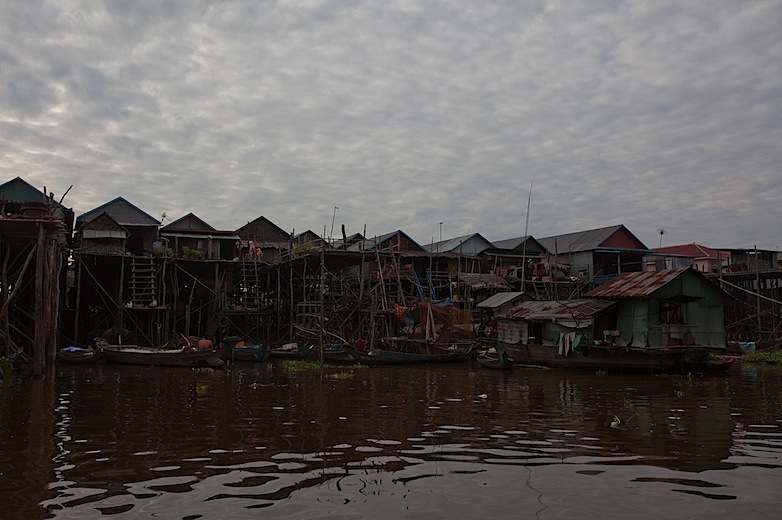 They live in houses built on stilts some 20/30 feet in the air. 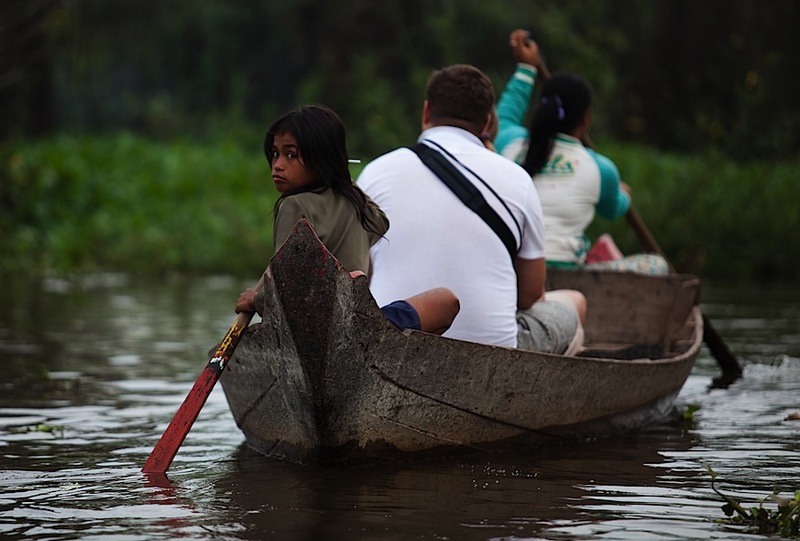 During the wet season, these villages are completely surrounded by water, accessible only by boat. In the dry season, you can drive out to them over the muddy river bed. During dry season, some build temporary villages along the shore and then take them down in the flood. It’s an amazing sight, to see so many buildings up so high. It’s quite poor, as you might imagine, and that much is apparent, both though the construction and though the lack of smiles from the local. At some point, they are probably sick of being ogled at by tourists, with the loud boats puttering around endlessly. But it’s an amazing place. 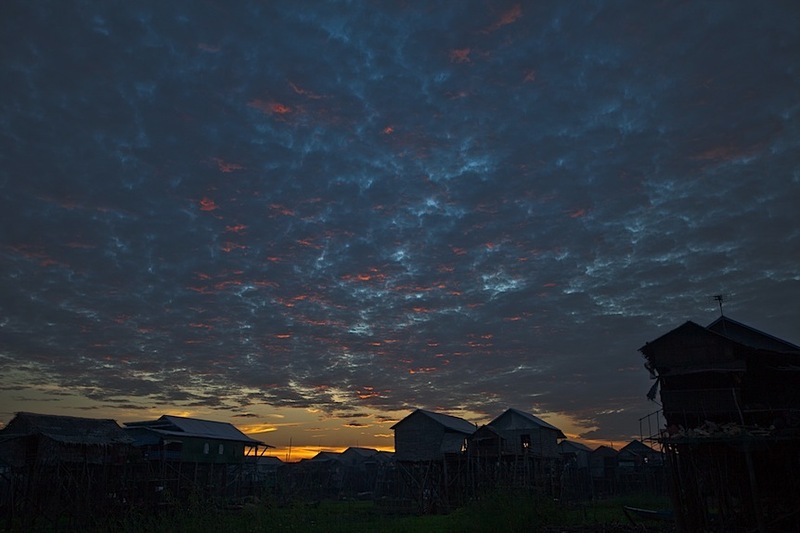 I was in Kampong Phluk, which of the three villages that can be gotten to, is the middle one as far as tourists go. Another village is much closer to town and is inundated with tourists and is best avoided. I hired a car and a boat to take me around. A French couple came along as well. We toured the village on a battered but sturdy boat. At this time of year, the water had receded about half of it’s height and the ground beneath the village was visible and dry. We walked around a bit and then did a little canoe excursion into the floating forest. Then back to the village for the sunset photos, and then home. It was for sure the highlight of the week. Tomorrow, Christmas Eve, I head back to Bangkok to escape the holiday madness, safely ensconced at my friend’s house. I leave Bangkok on Jan. 4th, to where I don’t know. I am uncharacteristically indecisive. So many places I can go. I feel like I am burning through too much money and need to get back to the Helpx thing. Since money is time in this new life, I am trying to strike a balance between helping and getting to see the world I am within. I figured out in Ireland that just because you are IN the country doesn’t mean you are actually SEEING it. And it’s cheap here for sure. I met a couple from France while I was on the beach. We got along smashingly and I agreed to show up at their door in the Pyrenees in the March timeframe, for some web design and some real work. They run a guest house in the south of France and I will help them out a bit. So at some point, this young man needs to head west. I might head to Egypt to help out one or two hosts in the Sinai, working on a farm for one and teaching kids for the other. We shall see. Long post for one short week! Thanks for reading. It’s been a busy week for photographs so there are a lot more up on Flickr.